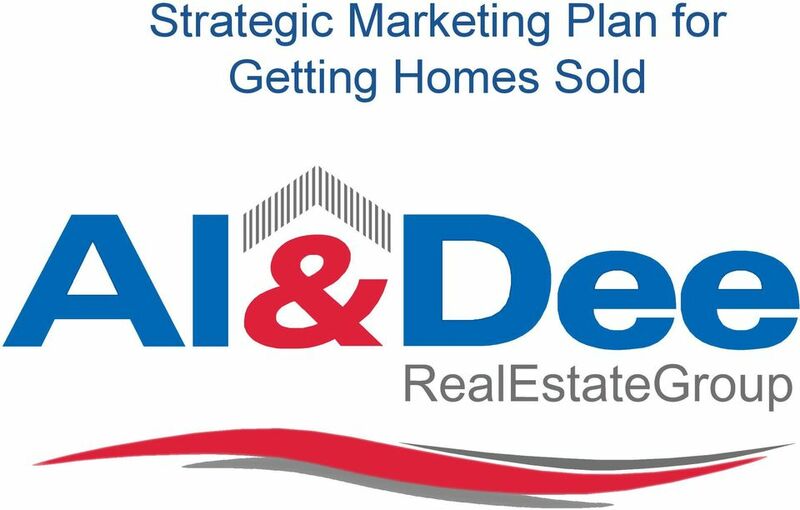 Download "Strategic Marketing Plan for Getting Homes Sold"
2 Award Winning Strategies There are a few unique marketing activities that, when completed, bring prospective buyers to properties we re selling. 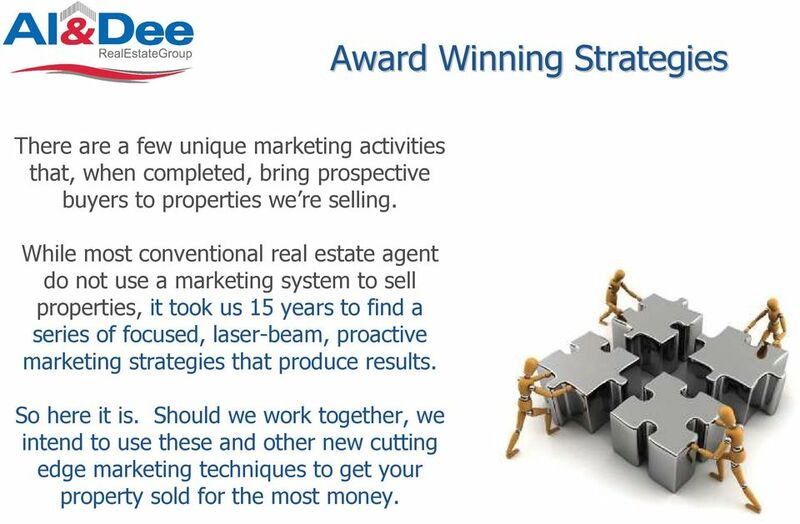 While most conventional real estate agent do not use a marketing system to sell properties, it took us 15 years to find a series of focused, laser-beam, proactive marketing strategies that produce results. So here it is. Should we work together, we intend to use these and other new cutting edge marketing techniques to get your property sold for the most money. 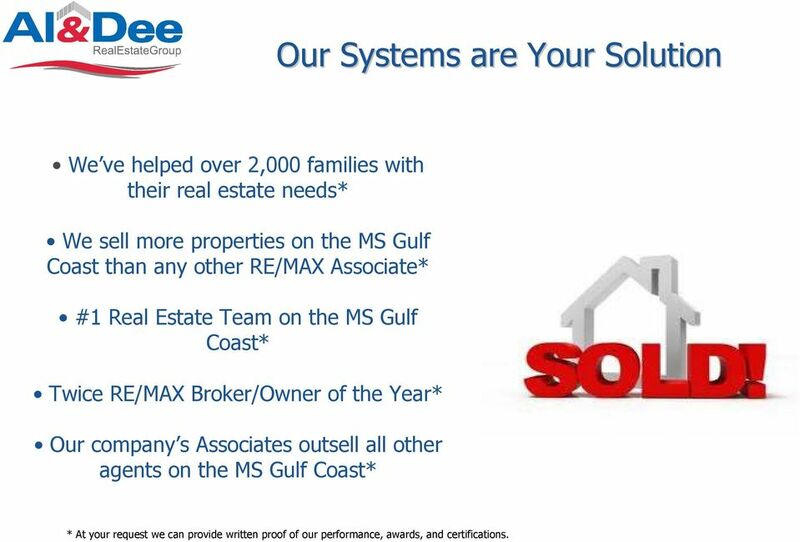 4 Our Systems are Your Solution We ve helped over 2,000 families with their real estate needs* We sell more properties on the MS Gulf Coast than any other RE/MAX Associate* #1 Real Estate Team on the MS Gulf Coast* Twice RE/MAX Broker/Owner of the Year* Our company s Associates outsell all other agents on the MS Gulf Coast* * At your request we can provide written proof of our performance, awards, and certifications. 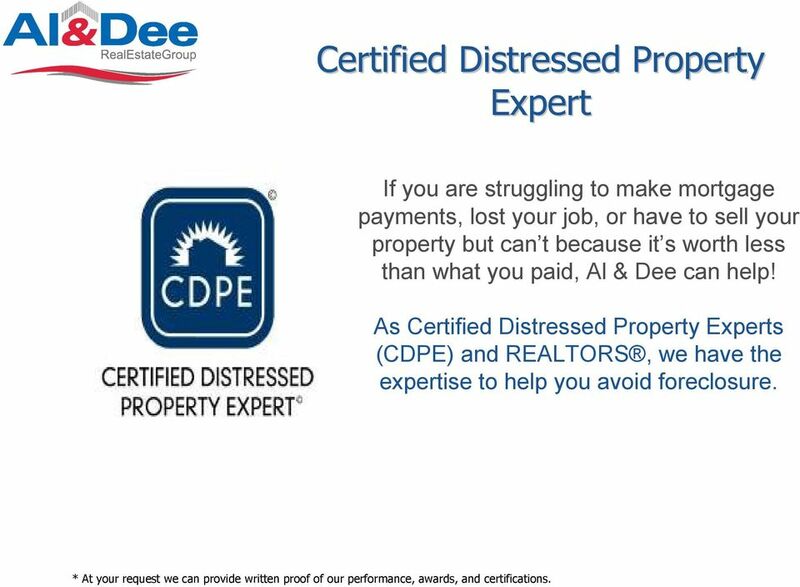 5 Certified Distressed Property Expert If you are struggling to make mortgage payments, lost your job, or have to sell your property but can t because it s worth less than what you paid, Al & Dee can help! As Certified Distressed Property Experts (CDPE) and REALTORS, we have the expertise to help you avoid foreclosure. * At your request we can provide written proof of our performance, awards, and certifications. 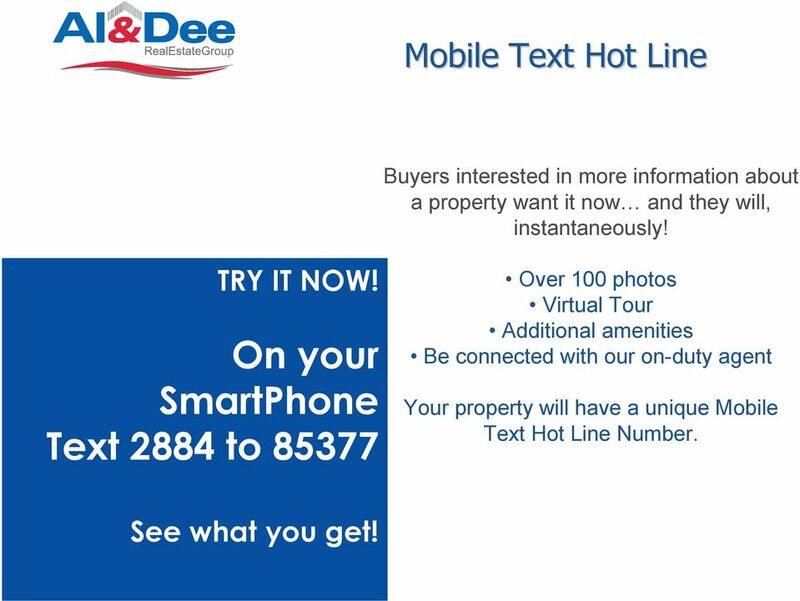 8 Mobile Text Hot Line Buyers interested in more information about a property want it now and they will, instantaneously! TRY IT NOW! On your SmartPhone Text 2884 to Over 100 photos Virtual Tour Additional amenities Be connected with our on-duty agent Your property will have a unique Mobile Text Hot Line Number. See what you get! 9 QR Codes Your property will have a QR Code that, when scanned with a SmartPhone, directs a prospective buyer to see additional information and photos of your property. This strategic proactive marketing tool is proven to increase the number of potential buyers. Would you like to see how it works? Try it now. Scan this QR Code with your SmartPhone. 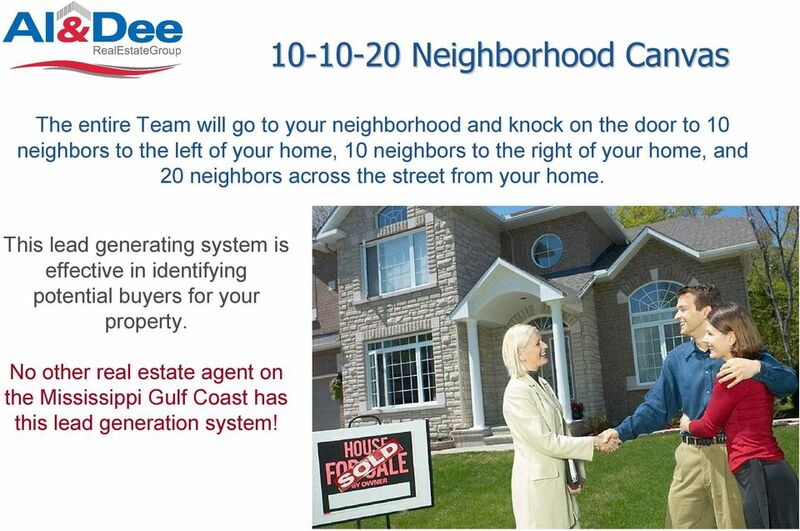 No other real estate agent on the Mississippi Gulf Coast has this lead generation system! 10 Your Listing Will Go Viral! 17 Neighborhood Canvas The entire Team will go to your neighborhood and knock on the door to 10 neighbors to the left of your home, 10 neighbors to the right of your home, and 20 neighbors across the street from your home. This lead generating system is effective in identifying potential buyers for your property. 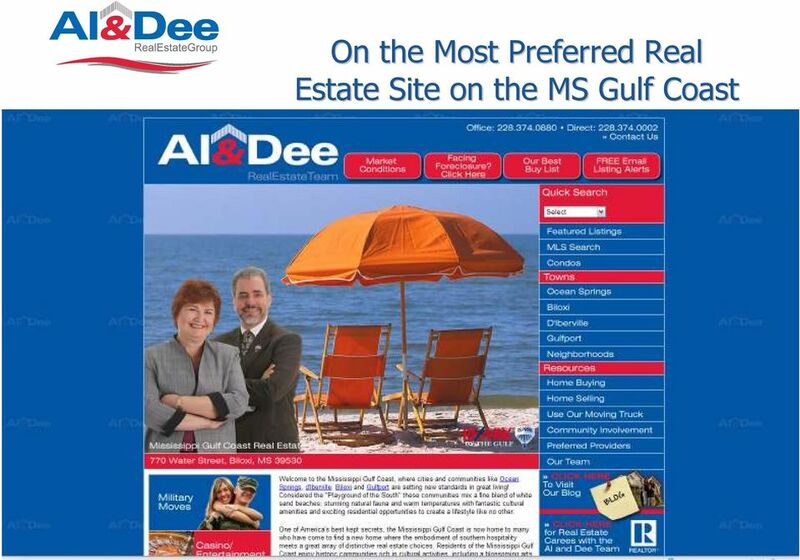 No other real estate agent on the Mississippi Gulf Coast has this lead generation system! 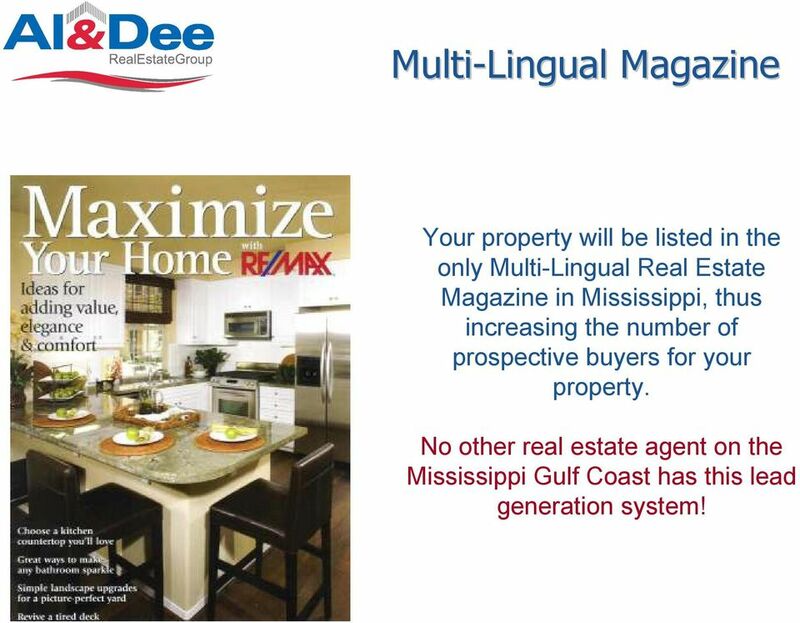 18 Multi-Lingual Magazine Your property will be listed in the only Multi-Lingual Real Estate Magazine in Mississippi, thus increasing the number of prospective buyers for your property. No other real estate agent on the Mississippi Gulf Coast has this lead generation system! 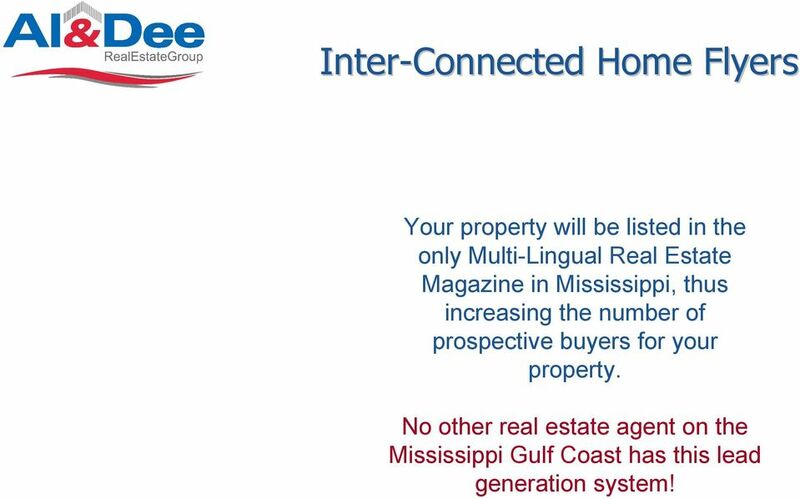 19 Inter-Connected Home Flyers Your property will be listed in the only Multi-Lingual Real Estate Magazine in Mississippi, thus increasing the number of prospective buyers for your property. 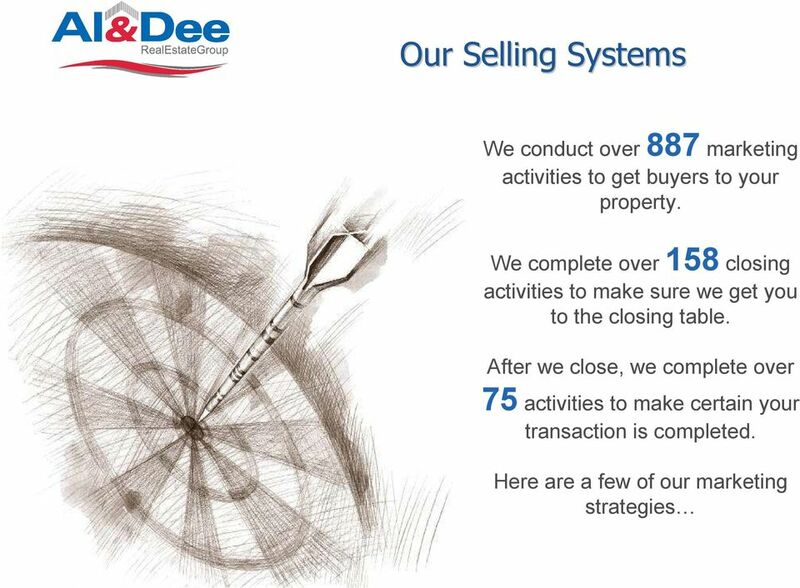 No other real estate agent on the Mississippi Gulf Coast has this lead generation system! 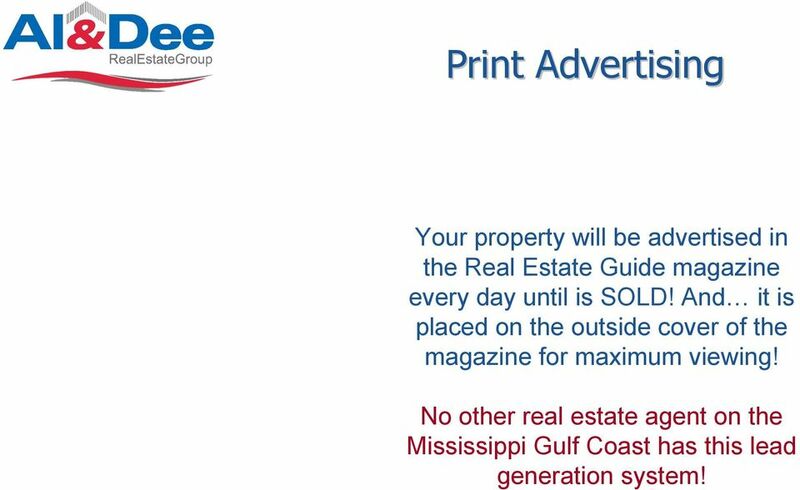 20 Print Advertising Your property will be advertised in the Real Estate Guide magazine every day until is SOLD! And it is placed on the outside cover of the magazine for maximum viewing! 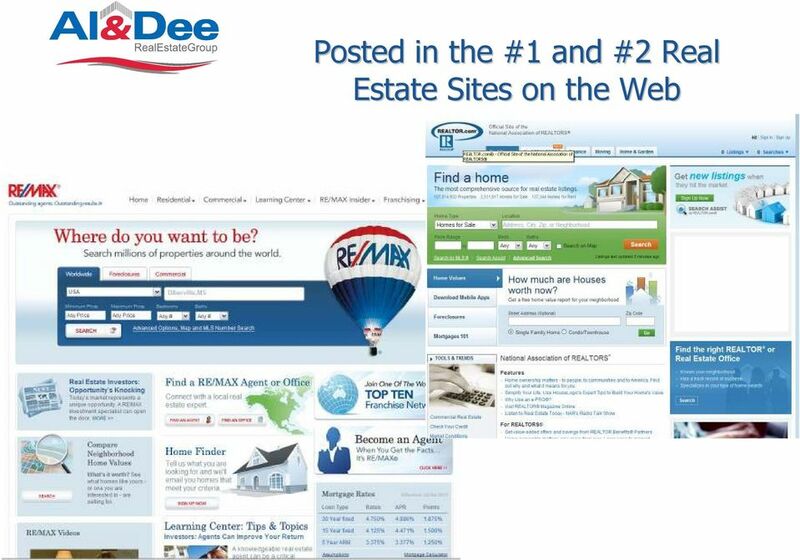 No other real estate agent on the Mississippi Gulf Coast has this lead generation system! 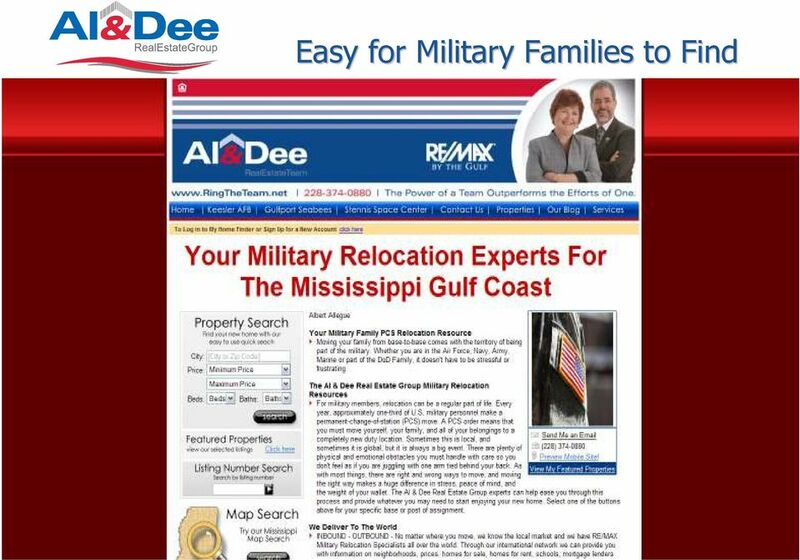 21 Weekly Targeting of Prospective Buyers for Your Property Every week the Al & Dee Real Estate Group s their al & dee REAL ESTATE NEWS special SUNDAY edition to over 5,000 prospective home buyers. This will place your property in front of buyers now ready to buy. 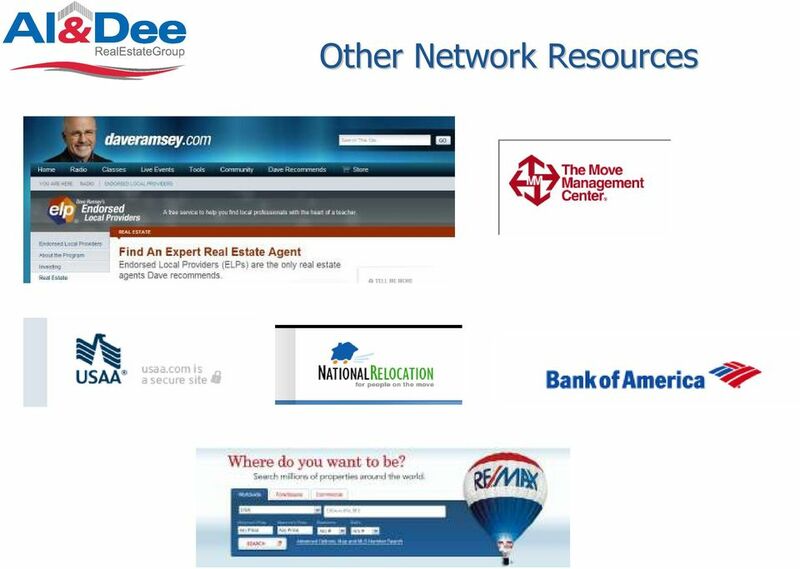 No other real estate agent on the Mississippi Gulf Coast has this lead generation system! 22 Virtual Open House With gasoline as expensive as it is, more and more prospective buyers would rather attend an Open House from the comfort of their home and see as many homes as they like. 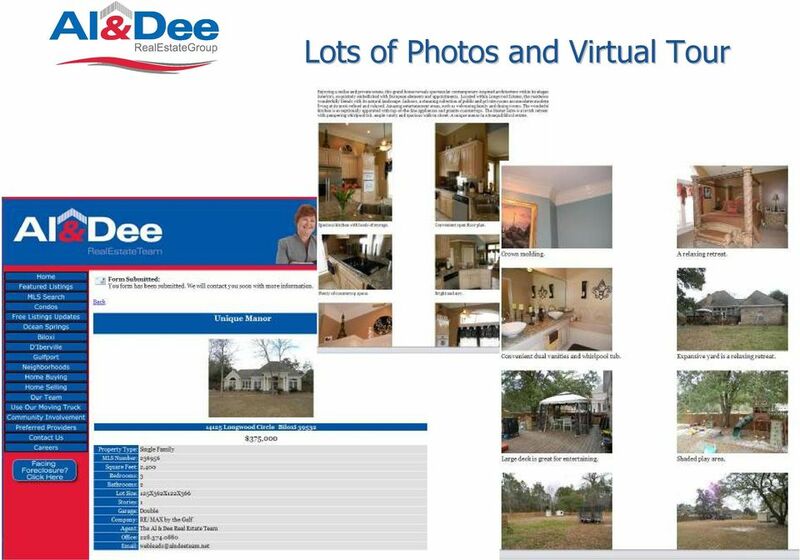 No other real estate agent on the Mississippi Gulf Coast has this lead generation system! 23 A Unique Virtual Tour The Virtual Tours of our listings are not MLS generic like the others if you are lucky to get one. Our Virtual Tours are specifically designed to express the best selling features of your property. 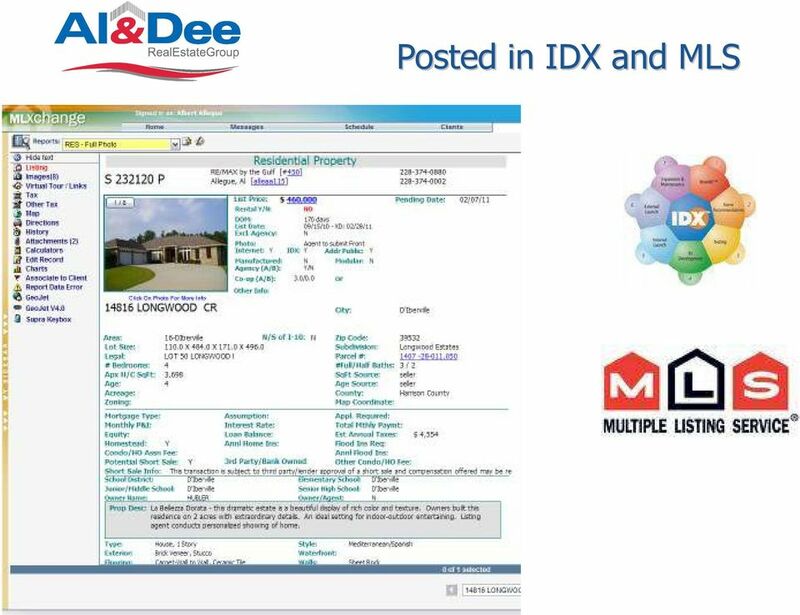 And they are posted on Al & Dee s YouTube TV Channel for maximum exposure to potential buyers. 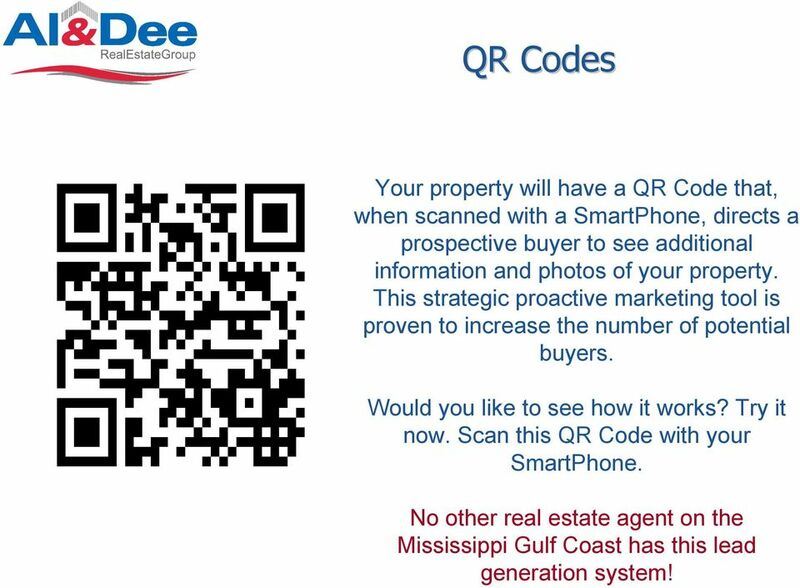 No other real estate agent on the Mississippi Gulf Coast has this lead generation system! 24 Our Team Members Answer Calls on Your Property In a conventional real estate company they have floor duty. That means lead calls are answered by someone who perhaps has never seen your home, a new agent that needs business, or even someone who doesn t know how to turn a lead call into an appointment. 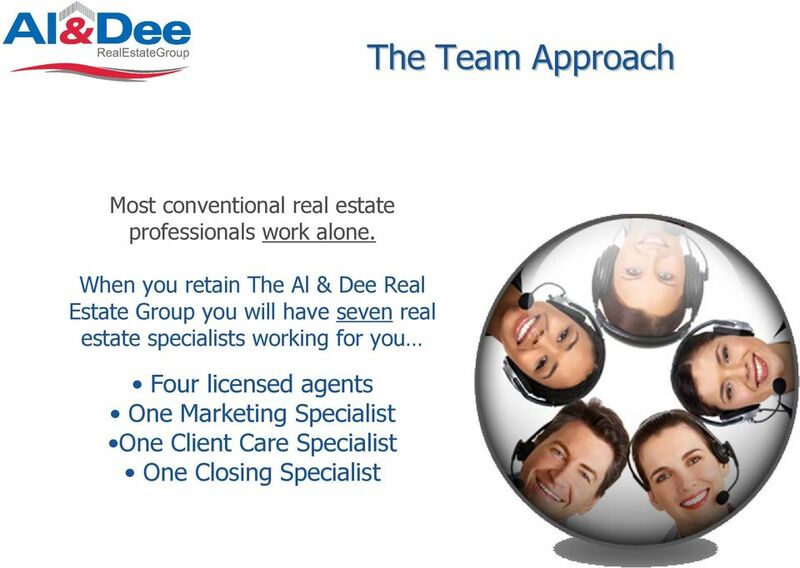 At The Al & Dee Real Estate Group we personally answer our lead calls we ve seen your property, we are not rookies, and we definitively know how to qualify a prospective buyer. 25 Weekly Feedback Report We ll be in contact with you weekly with marketing updates, market condition report updates, showings results, and marketing strategies. We will be in contact with you often GUARANTEED! Welcome. Sales or lettings, moving and mortgage advice. We ll be with you every move. How to make the most of ebay Motors. Quick Guide 1. Improve Your Listings, 2. Manage Your Prospects, 3. Advertise Your Website. 1. 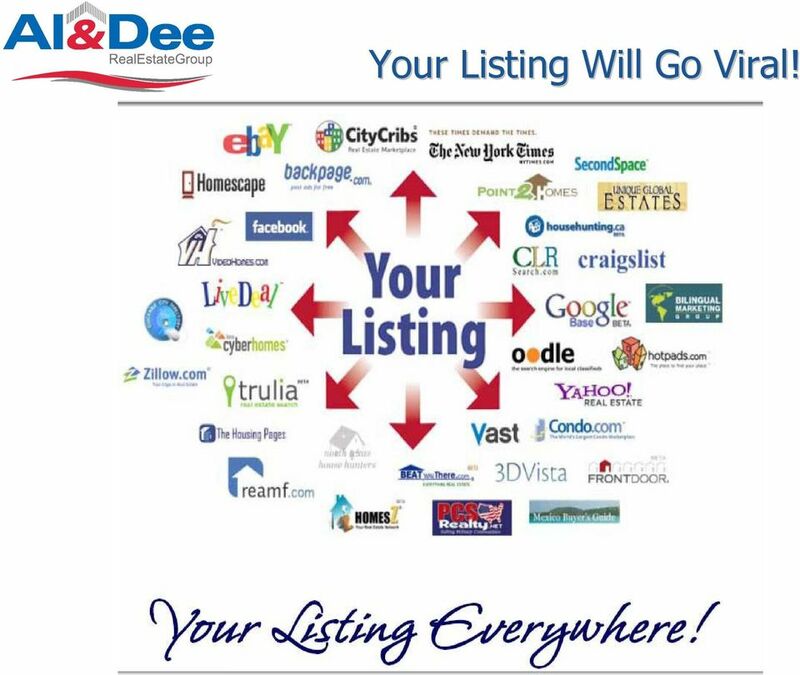 Improve Your Listings: Why? How? 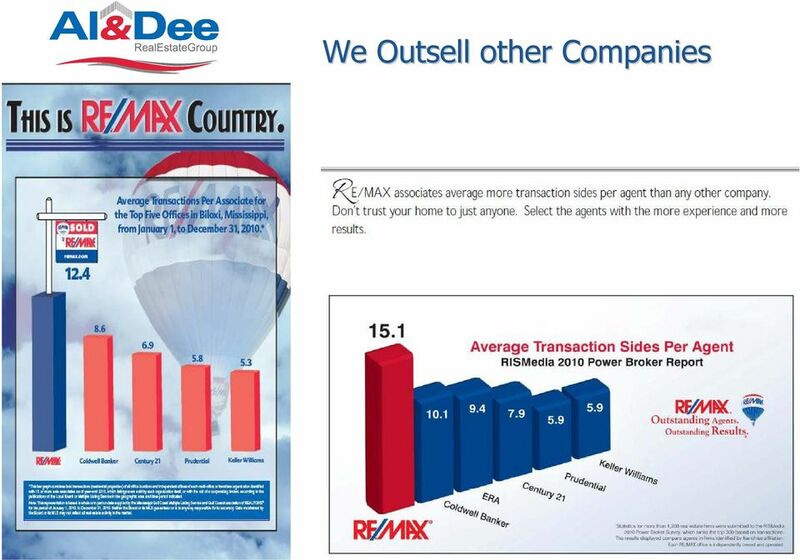 Real Estate Weekly 2013 MEDIA KIT. 3355 Grandview Highway, Vancouver, BC V5M 1Z5 P: (604) 435-7977 F: (604) 439-2630 rewads@rew.ca www.rew.